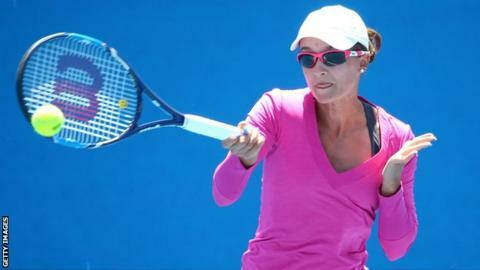 Arina Rodionova will be busier than most brides on her wedding day as she attempts to win a wildcard to the Australian Open. The 26-year-old will play a qualifying match in the morning before tying the knot in the afternoon. The Russia-born Australian needs to win two matches to qualify for the first Grand Slam of the year, which begins on 18 January. Rodionova had been due to play compatriot Storm Sanders on Saturday afternoon, which would have clashed with her wedding to Australian Rules football player Ty Vickery. But tournament organisers and her opponent agreed to move the match to the morning. If Rodionova beats Sanders in the play-off-semi-finals, she will be back at Melbourne Park on Sunday for the final. She told the Sydney Morning Herald she would be taking it easy at her wedding as a result, if she makes it that far. "I don't think brides should be very drunk at the wedding," said the world number 309. "That's not a good look, so I'm definitely not going to be having more than three. It should be good." Pique v Madrid: Will it ever end? Read more on Gerard Pique takes on Real Madrid: Will it ever end?